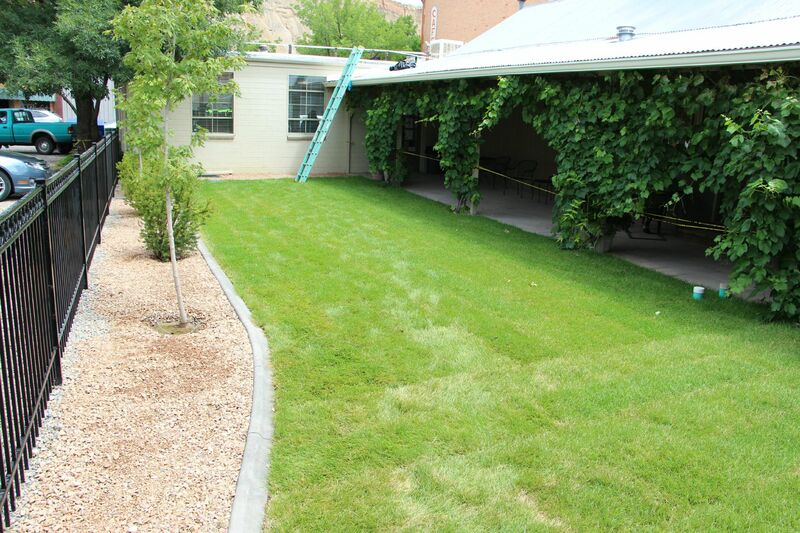 New landscaping at the Palisade Branch Library includes a lush, green lawn. Trees and shrubs are part of the new landscaping at the Palisade Branch. The shade-covered patio, set off by vines, is an even more pleasant place to read now with the completion of the landscaping project at the Palisade Branch. Front windows at the Palisade Branch will be replaced in early August. A newly completed landscaping project at the Mesa County Libraries Palisade Branch, 119 W. Third St., has created a lush, patron-friendly space adjacent to the covered patio. 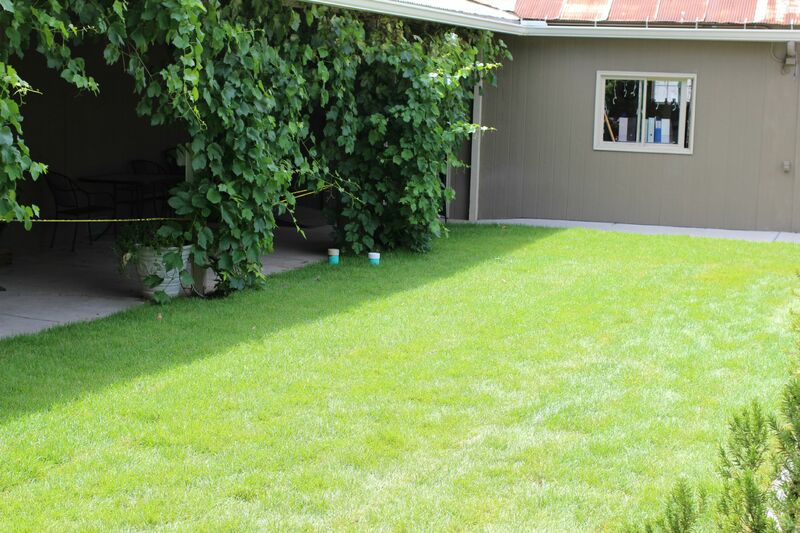 A new lawn, along with some shrubs, young trees, and a fence, give the library’s patio a down-home, backyard feel. 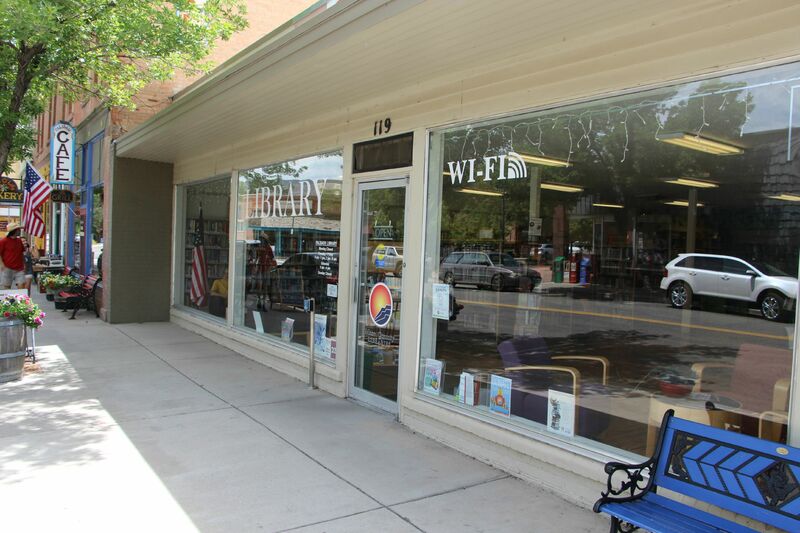 Many Palisade Branch patrons enjoy reading outside on the patio, and the lawn makes the experience even more pleasant. Prior to the landscaping, the space was mostly soil and rock, with little separation from the adjacent parking area. 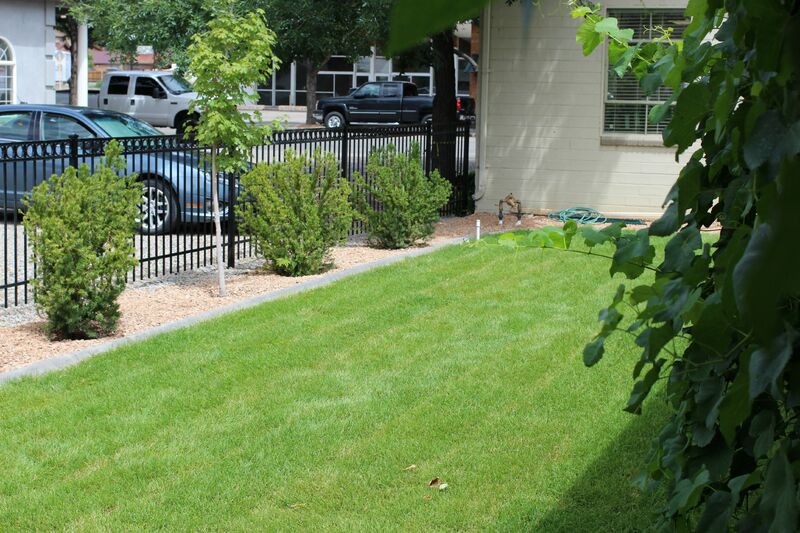 Now, an attractive metal fence sets off the new lawn and landscaping from the parking lot. Tim Davis, facilities manager for Mesa County Libraries, said the lawn will serve not only as an appealing addition to the Palisade Branch, but as a more useful space for outdoor events at the library. Landscaping isn’t the only upgrade that the Palisade Branch is receiving this summer. During the first two weeks of August, aging windows in the front portion of the building will be replaced. The new windows will improve the library’s energy efficiency. The Palisade Branch will be open on its regular schedule during the project, although there may be some minor inconvenience to patrons. Window replacement is expected to be completed before the Palisade Peach Heritage Parade on Aug. 15. The Palisade Branch’s current location downtown officially opened Oct. 11, 2011, and has proven to be a popular destination for Palisade-area residents, as well as a stop for people visiting the area. UPDATE (JULY 29, 2015): Due to circumstances beyond our control, the window-replacement project will be delayed until after mid-August.